Trapping is a horrible act and should be illegal. Animals caught in traps are left to suffer, they have no way out except for gnawing their own limb off. Also, the animal intended to be caught isn’t always caught. Sometimes, dogs, cats, other wild animals and even people can be caught in a trap, depending on where it is put. There recently have been a few instances when a beloved family pet was killed by a trap put just 30 feet from it’s yard, and people out enjoying a peaceful walk in the beautiful outdoors with their pets and suddenly their faithful companions are caught in these horrific traps! They must have been devastated and horrified to see their pet in a trap and they can’t do anything about it. As of January 17, 2012 Idaho hunters have killed 239 wolves. 190 innocent animals by hunting, 49 by trapping. Some people are saying that there are “too many wolves” and the wolves are eating “their elk”. We share the Earth with all living creatures. It’s not “their” elk, and in fact humans kill the HEALTHY elk and wolves kill the sick and the weak. Wolves make the elk herds stronger. Also, in Montana, they have extended the wolf hunt until April 1, which is also breeding season and when wolf pups are born. They did this because they couldn’t kill “enough” wolves. People call the killings of these beautiful, innocent animals wolf “management” or the wolf “harvest” to make it sound good, when it is the complete opposite. Not only are they hunting, but they are also trapping the wolves. So a wolf, just minding it’s own business, not even doing anything wrong, could get caught in the trap. No food. No water. Just themselves and the painful trap. If the animal is caught in a snare trap, it would have to suffer in agonizing pain for five to seven minutes! If the wolf was caught in a foothold trap, it would suffer for a longer period of time. In Idaho, trappers must check their traps every three days to “prevent” the suffering of an animal. And it doesn’t stop here. If the animal is trapped for fur, the trapper doesn’t shoot it because it could damage the pelt. Instead, trappers club or stomp the animal to death. This innocent animal, being tortured, mistreated, left to suffer and abused and it didn’t even do anything wrong at all. Nothing. People just do this out of fear and hatred or just to make money for the pelt. If anyone attempted to do this to a cat or dog, they would be arrested. So why is it ok to do this to our wildlife? 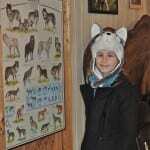 This entry was posted in All News, Alyssa's Den, Front Page News, News, Regional Wolves, WolfWatcher. Bookmark the permalink. Montana Wolf Hunt Extension: Your Comments Needed! Error: Error validating access token: Session has expired on Friday, 22-Mar-19 12:26:11 PDT. The current time is Sunday, 21-Apr-19 03:14:42 PDT.